My mom wanted to be a stay-at-home mom, but family finances drove her in other directions, and so she spent much of my junior high and high school years working outside the home. When I was in elementary school in Nashville, she cleaned houses for some of my more well-to-do classmates (and kids never tease you about that — not that I’m bitter), but toward the end of our time there, she started working at Fotomat, and donned the smock once again after we moved to Cincinnati. At this point, some of my younger readers may want to know what Fotomat was. In what the Spawn calls “olden days” (a term she uses to cover the period from the Big Bang until the mid-1990s), photographers used actual film — emulsion-coated plastic. The film had to be developed, usually by treating it with chemicals in a light-controlled environment, and enlarged/printed before the photographer got the finished picture. Obviously, professional photographers had ready access to the labs and gear they needed for this process, but for the average Joe or Jane, it was necessary to take the exposed film somewhere and wait a few days before getting the pictures back. 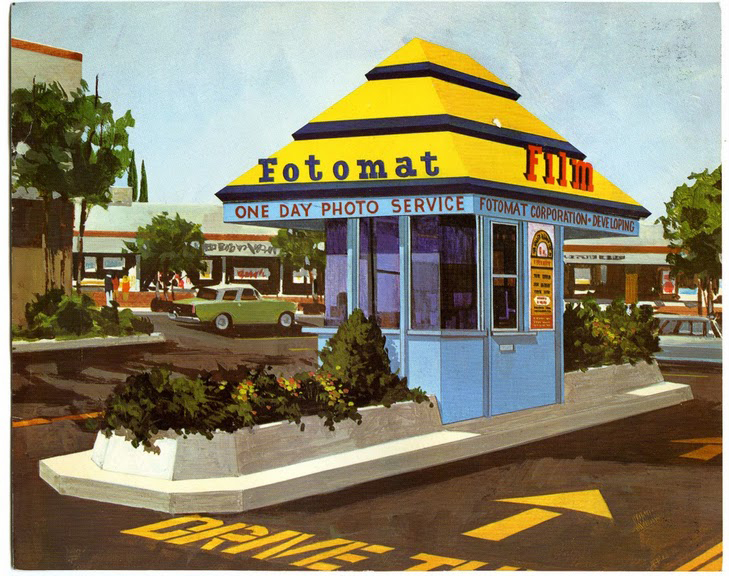 Fotomat was a chain of those somewheres — little freestanding kiosks where customers would drive up and drop off their film. The kiosks would courier the film to a central lab, which would return the prints in as few as (ta-daah) 24 hours. MOM (Answers phone): Thank you for calling Fotomat — how may I help you? CUSTOMER: Do y’all develop… all kinds of pictures? MOM: Unless it’s really odd film stock, yes. C: Well, I meant… um… special pictures. M: Is there a dog in it? M: (Heavy sigh). Sir, unless there’s a child or a dog in it, we don’t care. C (startled): Oh. Well, okay, then. Other, more ordinary customers would drive by on a regular basis, sometimes without doing business, unburdening themselves about their lives and problems. A local priest told her it was because her store looked like a confessional. But a bit more seriously, that was the kind of person Mom was — people opened up to her. And that was true of her relationship with her coworkers as well, some of whom remained friends of hers even after she retired, and after one-hour processing and digital photography eliminated the Fotomat chain, all the way to the end of her life. All this was triggered a little while ago when a Facebook friend of mine posted a picture of a film canister, as part of one of those nostalgia posts that one sees from time to time. When my brother was small, Mom would occasionally bring a few home, and Michael would keep things in them — a piece of gravel, a dead bug, the sorts of things little boys accumulate. It isn’t as elegant as Proust’s madeleine, but it’s interesting what a single picture can recall. This entry was posted in Culture, Family, Why I Do What I Do. Bookmark the permalink. A sweet post, Prof. Thanks for it. I can picture your mother having such a conversation with a customer! It’s funny how inanimate object can trigger good memories. I’m smiling as I read this. I remember that story from your mother (about special pictures). I am so sorry you have lost her.